INDIANAPOLIS -- Carrier contemplated staying in Indianapolis, but it would have come at a great cost to its workers. Carrier decided in February to move 1,400 Indianapolis jobs (2,100 in total) to Monterrey, Mexico. Following that announcement, representatives from the United Steelworkers Union and United Technologies, which owns Carrier, met for negotiations. Call 6 Investigates found out that during those talks Carrier apparently told the union they could possibly stay if the workers agreed to cut their pay from about $23 an hour to $5.85 an hour. 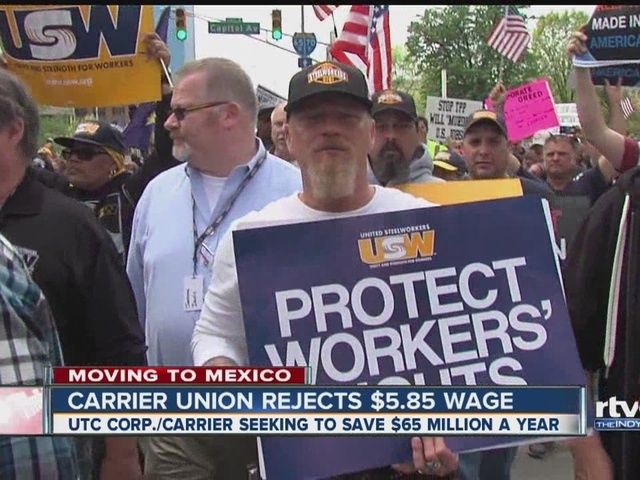 Carrier is supposed to save about $65 million a year when it moves to Mexico in 2017. Hundreds of people attended a rally Friday at the statehouse protesting Carrier's decision. Presidential candidate Bernie Sanders told the crowd that bad international trade policies are enabling corporations to shut down American factories and move work to countries with lower wages. Sanders said that corporate decisions such as Carrier's are hurting the country's middle class. United Technology and Carrier have repaid the City of Indianapolis $1.2 million the company received in tax breaks. Mayor Joe Hogsett made the announcement on April 7. On March 3, Hogsett had called on Carrier to return the $1.2 million within 30 days. The mayor says the money will be used to retrain Carrier workers. RTV6 has been covering the story from the moment in broke with a viral video of the announcement to the employees of Indy's plant. "We are disappointed the union has apparently chosen to negotiate through the media, rather than engage in productive discussions with us. The company never suggested our employees should work for $5.85. The union was told that to achieve the $65 million in annual savings resulting from the relocation, the average hourly wage rate would need to be $5.85 per hour. That is not possible and shows why the company believes the union cannot offer concessions sufficient to change the company's intent to relocate. That’s why it’s time for the union to return to the table to talk about what’s important now, reaching an agreement that provides clarity and certainty for our employees during the transition." You can watch Episodes 1 and 2 of our digital exclusive Carrier documentary series below.